Maybe my problem is that I try to understand things. So here I am, amid all this hue and cry about interest rates shooting to the moon in order to contain rapidly rising inflation and I find myself asking, inflation? what inflation? The CRB commodities index broke down from its long term uptrend line last year and has been going lower since. And gold, probably the most watched gauge of inflationary expectations, has just done the same. 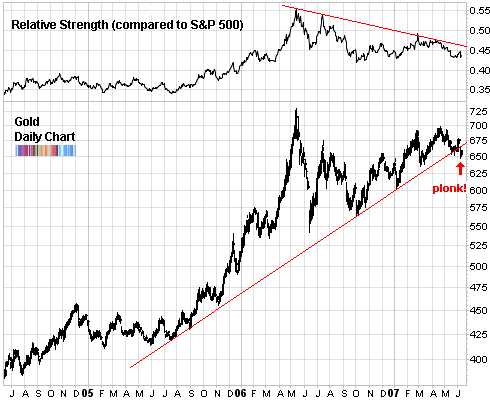 Last friday gold didn’t hold the $665 level which was support provided by the long term trendline (see graph). Instead it easily sliced through in a wide range bar and reached a low of $647.80. Not the sort of price action that is congruent with an inflationary scenario, wouldn’t you think? I’ve been wary of gold for a while now. But in any case, bonds have been taken to the back alley and beaten to a pulp. Time to buy the panic? If there is an opportunity, it’s between now and Friday morning - when the CPI numbers will be released. You know the drill: buy the rumour, sell the news.